Almost. It was 19 innings, 40 players, and 569 pitches thrown by 16 pitchers before the Red Sox finally succumbed to the White Sox, 6-5, in a game that by time ranks as the third-longest played by the Red Sox -- 6 hours 19 minutes. First pitch: 1:07 p.m Chicago time. The last, thrown by Rudy Seanez that was grounded through the left side by Tadahito Iguchi for the single that scored Alex Cintron, came at 7:26. In the interim, Red Sox starter Curt Schilling was knocked out in the sixth inning by a line drive that took an NBA carom off his right elbow, Papelbon was stunned by a home run by Jermaine Dye with Boston one out away from a win in regulation and a sweep of the White Sox, Mike Timlin coughed up a two-run lead in the 11th, Julian Tavarez pitched his best four innings in a Red Sox uniform to extend the afternoon, and even Seanez gave Boston two good innings before finally being done in by four straight singles in the 19th. The last was struck by Iguchi, who had begun Chicago's scoring with a solo home run off Schilling, then twice blew bunt chances in extra innings before punching a single between third baseman Alex Cora, who had entered in the 11th and wound up with four at-bats -- his last, a drive to the track that Dye ran down with a terrific catch to end the top of the 19th -- and shortstop Alex Gonzalez. ``So many things happened," Red Sox manager Terry Francona said. ``Crazy inning, the one that Timlin pitched. Bodies flying all over the field, going in different directions, a crazy game." David Ortiz, who had homered eight times in his previous eight games but was limited to a broken-bat RBI single in his first at-bat yesterday, expressed the general feeling in a Red Sox clubhouse in which players had expected to be on their way home for the All-Star break long before they were able to vacate the premises. ``I'm DHing and I'm exhausted," said Ortiz, who is being counted upon by Major League Baseball to show up fresh tonight as the marquee attraction in tonight's Home Run Derby in Pittsburgh. ``There gets to be a part of the game where you can't take it anymore mentally." Ortiz said he caught some of the World Cup final on television yesterday, which was decided on penalty kicks, Italy prevailing. ``I have an idea for you," Ortiz said. ``I figure that in baseball you can do something like that. Play 15 innings, and if no one scores a run in the 15th, the manager of our team picks one of their players, the manager of their team picks one of ours, and you have a Home Run Derby. Ten swings." The biggest swing yesterday belonged to Dye, who wiped out the one-run advantage the Sox had carved out against White Sox ace Jose Contreras by taking Papelbon deep in the ninth. It was Papelbon's third blown save of the season, but the first run the rookie All-Star has allowed on the road. Dye, who had homered twice off Josh Beckett the day before, hooked an 0-and-1 splitter from Papelbon that lingered over the plate. ``Since Manny's not going to the All-Star Game, this is the guy who should be the starter," said Cora, who turned a mind-boggling double play in the 17th, after the White Sox had put their first two runners on base against Seanez, who hadn't pitched since June 30 and was Francona's last option after Tavarez gutted his way through four innings. What would Francona have done if the game had continued and Seanez had maxed out? ``We'd have had [Gabe] Kapler and [Doug] Mirabelli go down to the bullpen and have a pitch-off," said Francona, invoking the two position players he didn't use, while adding that righthander Jason Johnson wasn't available for unspecified reasons, hinting that Johnson may not be here when play resumes after the break, either. ``We were about out of bullets. It was getting tight." What happened on the pitch to Dye? ``I threw it really lackadaisical," Papelbon said. ``He hadn't seen my split the day before. I wanted to throw him something to where he would look at and not swing at, but it caught the middle of the plate. ``At the same time, he hasn't seen my split, and even though it wasn't a good one, you've got to give him credit for keeping that ball fair, one, and taking it out of the park. He was smokin' hot, on fire, between last night and today." Even then, the Sox forged back in front in the 11th on a two-run single by Mark Loretta, but the White Sox answered in the bottom of the inning. Jim Thome sliced an opposite-field double off Javier Lopez to open the inning, bringing on Timlin. Paul Konerko singled in front of Manny Ramírez, Thome stopping at third. Dye then doubled to the gap, scoring Thome and sending pinch-runner Ross Gload to third. An intentional walk to A.J. Pierzynski loaded the bases with no outs. Joe Crede lined out to right, Gload failing to tag and score on the play, which left the White Sox with two runners at third before Dye scrambled safely back to second. Cintron followed with a ground ball to second, the Red Sox just faling to turn the double play as Gload scored the tying run. ``Exhausted," said Loretta, who also was headed for Pittsburgh for the All-Star Game while Schilling heads home to rest his right elbow, which was left stiff and sore after Thome lined an RBI single off him in the sixth (X-rays were negative). ``It's a much different feeling if you win that game, even if you stay out there for 20 innings." The day couldn't have been any longer for Trot Nixon (0 for 9) and Jason Varitek, who went 0 for 8 in addition to catching all 19 innings. The Sox were 2 for 14 with runners in scoring position. 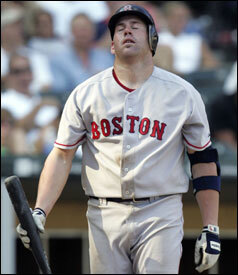 ``We lost a tough ballgame," Francona said. ``We'll bounce back, but I'm glad we don't have to bounce back tomorrow."